In that example above, switch adapting involved making permanent modifications to the object. Sometimes you can get around that if desired. Let’s say for example you had a radio with an IR remote. You could create an alternate IR transmitter that was switch adapted quite easily. 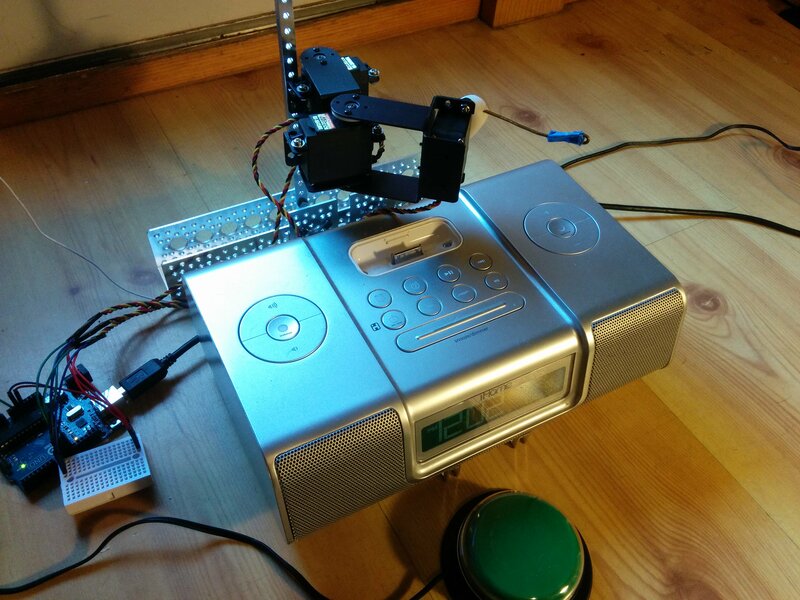 Using this alternate remote, the radio can be controlled with an adaptive switch without modifying either the original remote or the radio itself. Sometimes however you have a device where neither of those methods is applicable. And sometimes, given the details around ownership or the financial risk, direct modifications are not an option. 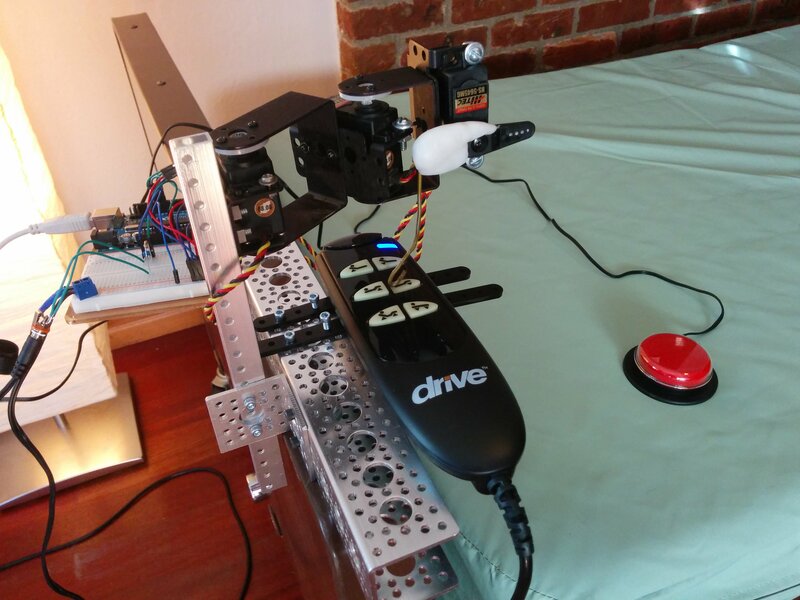 For those situations, one option can be a motorized button pusher. Then the button pusher is all that needs to be switch enabled. Again, no modifications were made to the bed itself. 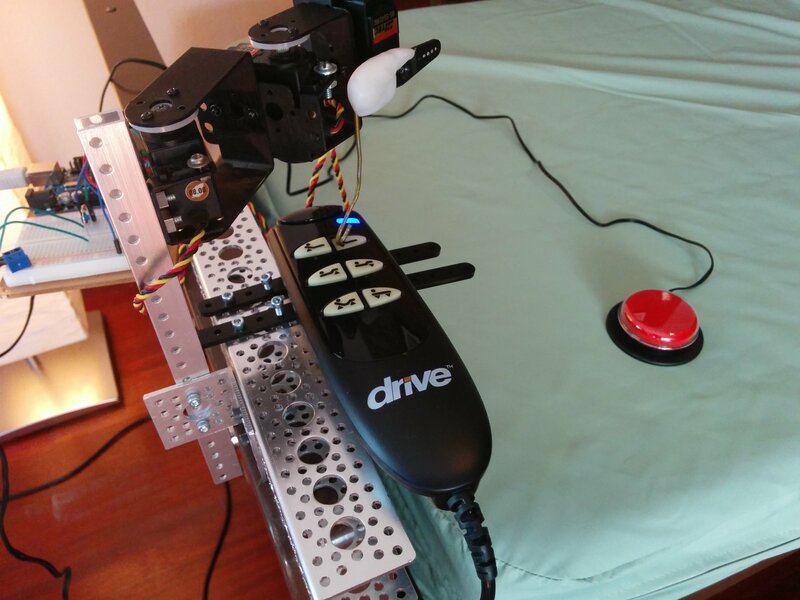 All that was done was to attach the button pusher to the bed using screw holes that already existed. In other situations it could be clamped on easily instead. 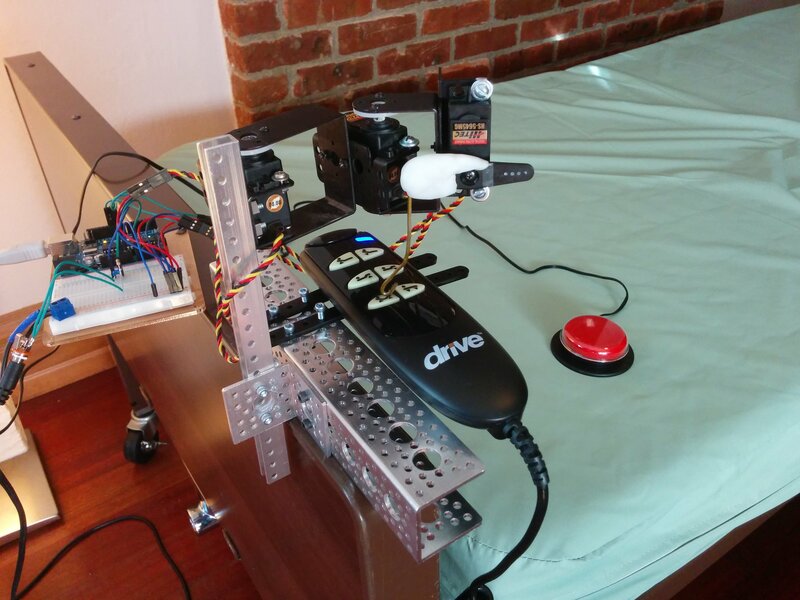 Or, if desired the button pusher and remote could rest on a table or other surface near the bed. For another bed I set up, zip ties worked well to mount the button pusher to the bed temporarily. This technique should not be used without additional safeties if there exists any manner of button pressing that could harm the user. In this example, if some of the bed’s positions could cause harm and if the controller failed or locked up, the user could end up in one of those positions and be injured. Although the example demonstrated here is controlling a hospital bed, this technique can be used in almost any case where you have an object that is already controllable with buttons. Safety and level of risk must always be considered for any equipment adaptation. The mechanism uses three servos: 2 of them provide the XY position over the target button, the 3rd controls pressing down on that button. I had to iterate some on the mechanism, but I ended up with something that can work for a wide variety of button layouts. 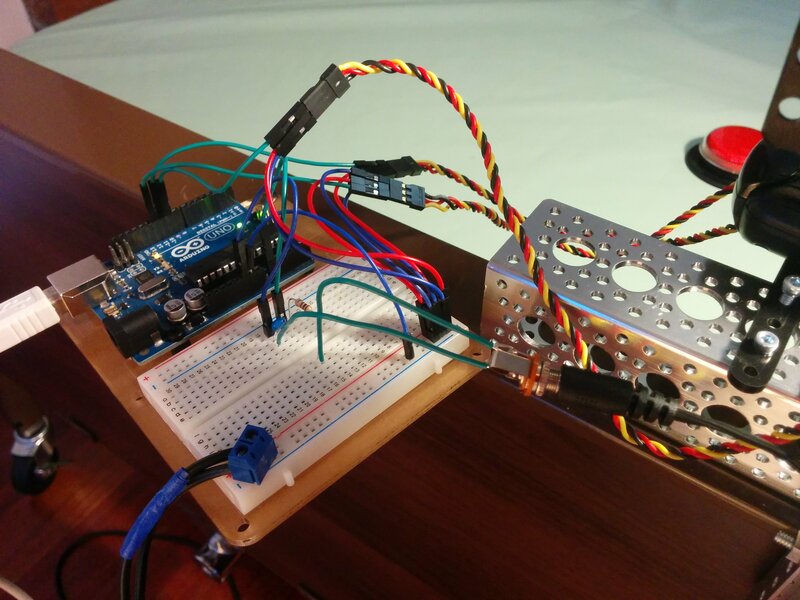 An Arduino is used to control the servos based on the adaptive switch, or voice commands via Amazon Echo. With any equipment modification, failure cases must be considered and their risk to the user understood. Given the bed example as-is, you MUST consider what would happen to the user if the button pusher locked up and continued pressing a button such that the bed went all the way to one of its extreme positions. You MUST also consider what would happen if the wrong button was pressed. If either of these could harm the user in any way, then this adaptation MUST NOT be used as-is without other safeties in place. Failure can be mechanical, or in software, or in the communication or connections between parts of the system. Individual parts must be tested and the system as a whole must be tested, rigorously, depending on the level of risk. That said, this technique is another way to further enable someone to control their environment. On the other hand, in the case of controlling something like a radio or TV, there may be no risk at all. 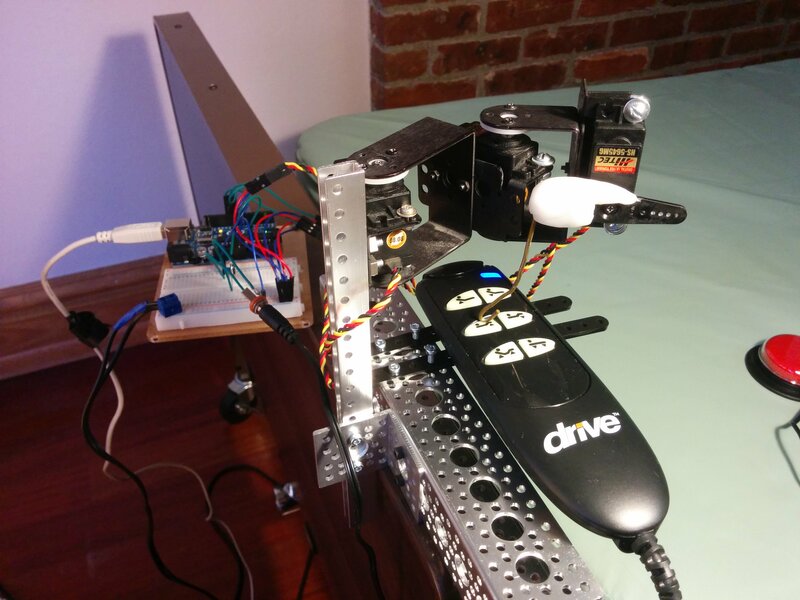 The .ino file runs on an Arduino and controls the servos. 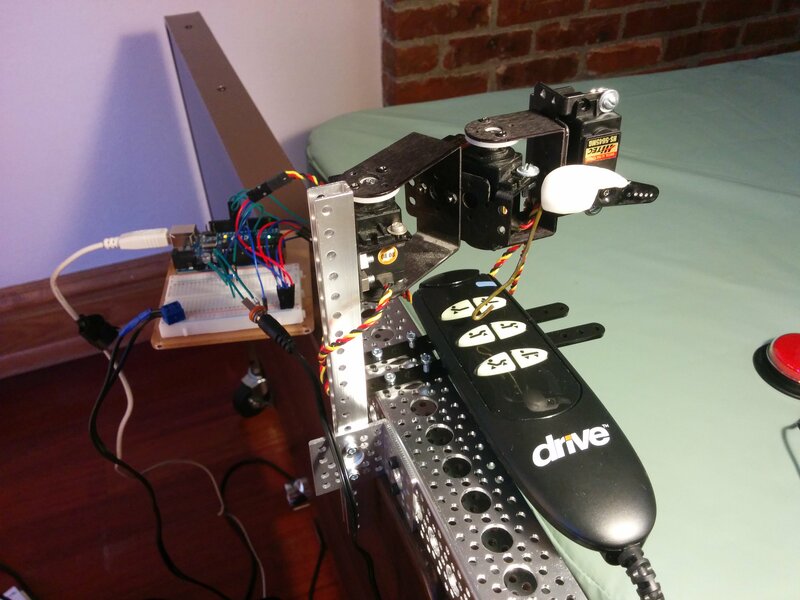 The .pde file runs in Processing on your computer as a means to more easily calibrate the servo positions. Your computer and Processing are not used at all and are unnecessary in the normal usage of the button pusher. 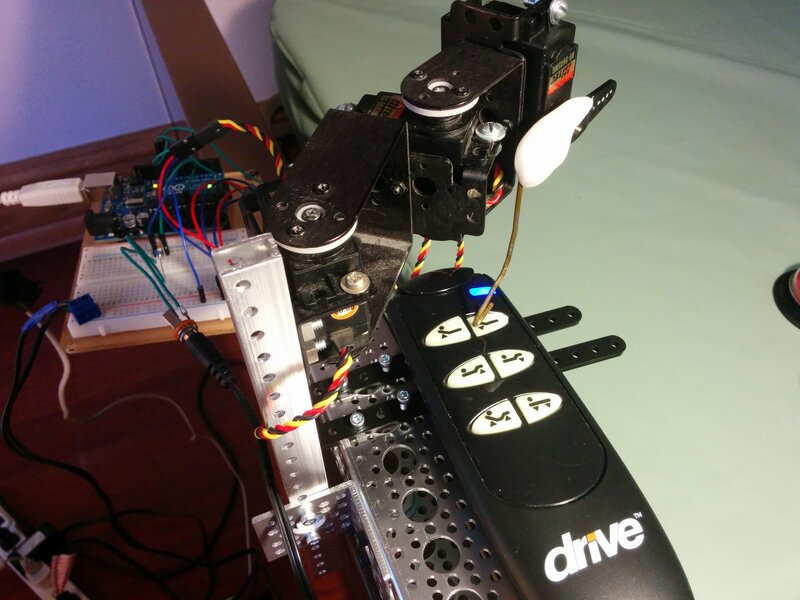 You can also send commands to the Arduino over it’s USB port to control the servos or calibrate them. Thank you for your comments sandeep. The analog pins on this microcontroller can be used as analog or digital. In this case I’m using A0 as digital, and have chosen it for it’s physical location on the opposite side of the board. Looks really nice. 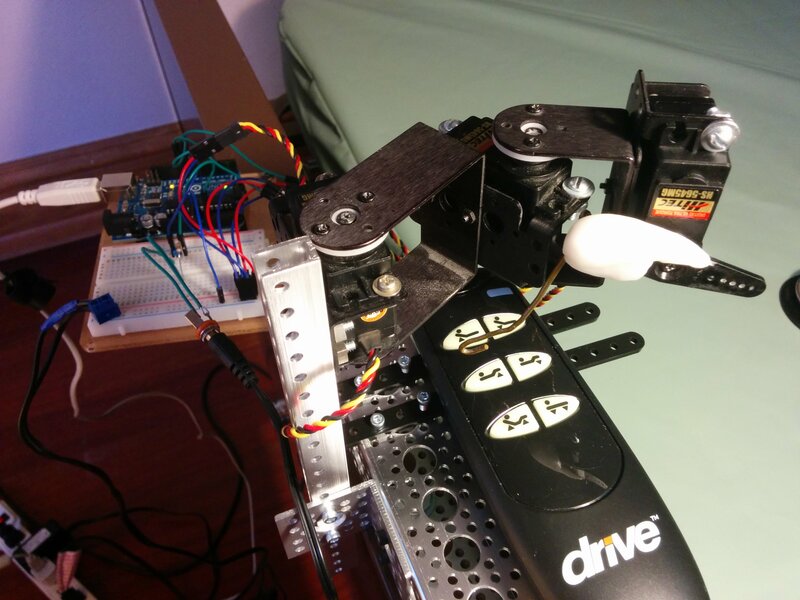 Can you tell me which servo motor you used? 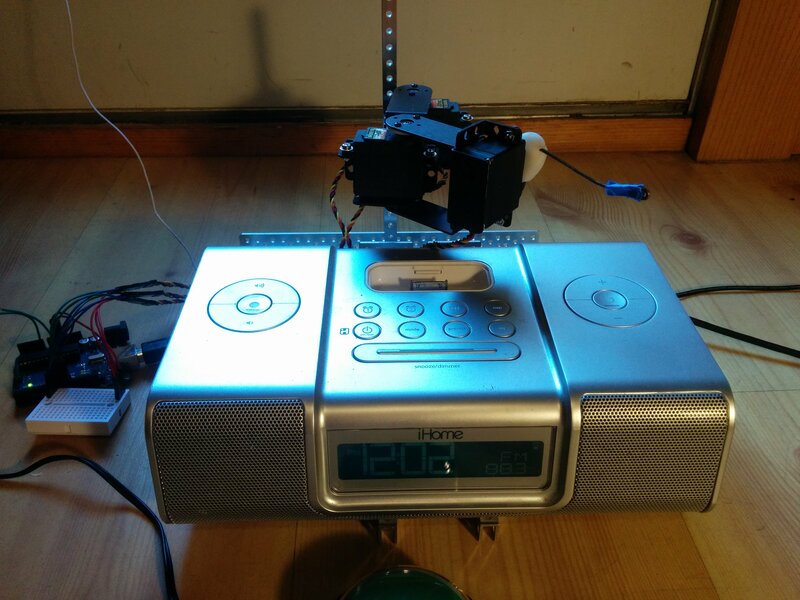 I am planning to do something like that to integrate my Bose Soundlink 3 Speaker into my Smart Home. 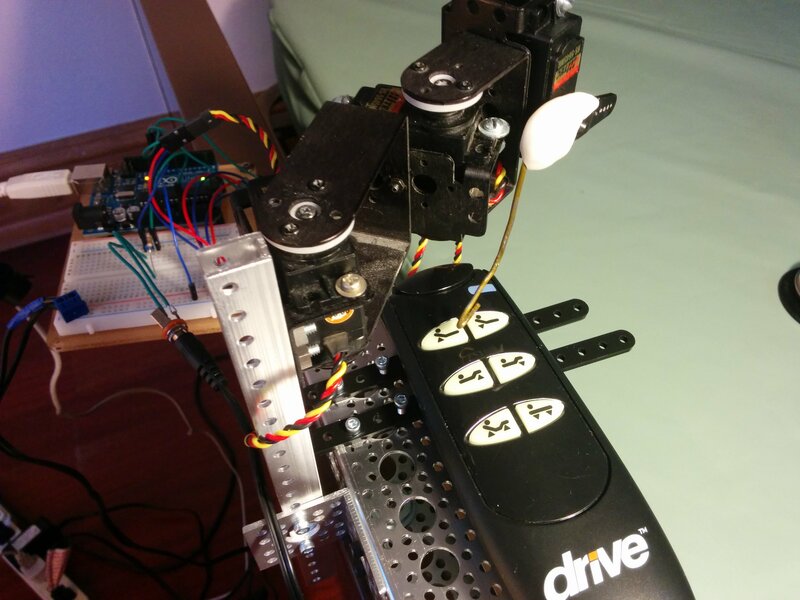 I already tried to use solenoids for button pressing but they were not powerful enough. Thanks! For this one I used Hitec HS-5645MG. Pingback: ICS Rehab Engineer, Bob Paradiso: There's a Hack for That!